Greetings and welcome to my blog. 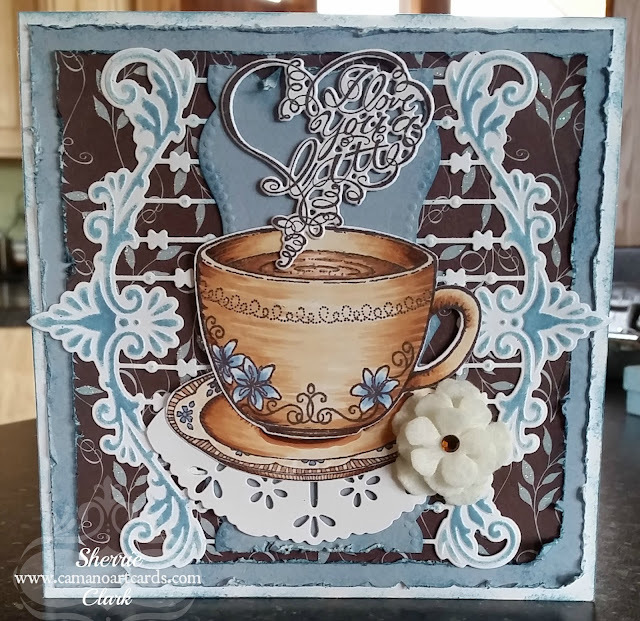 I recently purchased the Heartfelt Creations﻿ Coffee Talk Stamp and Die set. I really like this design and had fun creating a card with it using some paper from Colorbok. I used a Marianne Design Creatables LR0300 for each side and a Spellbinders Pendants die called Eyelets for the doily. I colored the Cup with Copic Markers and had another stamp from Stampin Up (1995) to create the saucer under the tea cup. The flower is made from a Spellbinders Die called Rose Creations and cut out of white felt then I placed a brown rhinestone in the center. Was a pretty simple card to create. Thanks for stopping by and may the Lord richly bless you. 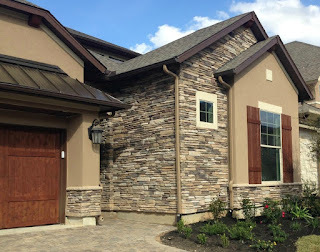 This is a one of a kind creation trying to match as close as possible the colors and design of their new home. The middle picture was taken before adding the bark and landscaping shrubs. Here is a close up of the front door. Thanks for stopping by and I hope you get inspired to create something wonderful. Leave me a message if you have any questions. 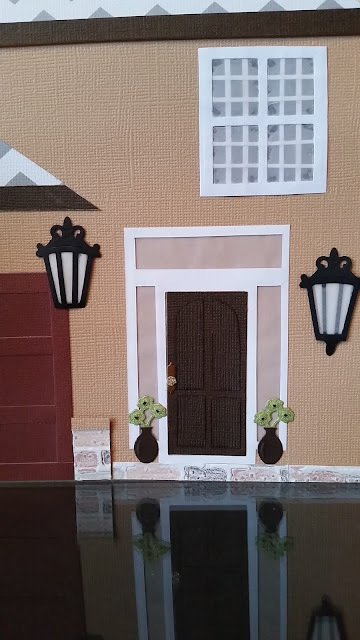 Accessories: Spellbinders: Victorian Picket, Lounge Around (small green sprigs in vases by front door), cottage cutz - Lamp Post w/Sign (outdoor lighting), Cheery Lynn Designs - Screen Door (door knob), Joy Crafts - Clouds, cottage Cutz - Grass with Cattails (shrubs), Impression Obsession Dies - Dogs Die. The rest was all hand cut. I also used a Brick Embossing Folder. Greetings crafters, hope you "HAD" a nice summer. Can you believe we are already so close to the Fall season. I can't wait. I had a wonderful summer with lots of projects to keep me busy. Obviously one of those was not posting a card since June 19th was the last time I was here. We did however get a new roof installed on our home which took three weeks, we had a wonderful palm tree planted outside my craft window, and we painted the fence around our property in the front. Never a dull moment. I have made several cards and card art projects the past few months but just never got around to posting any of them. So, here is the unveiling of one of them I made for my sister in-law Debbie. 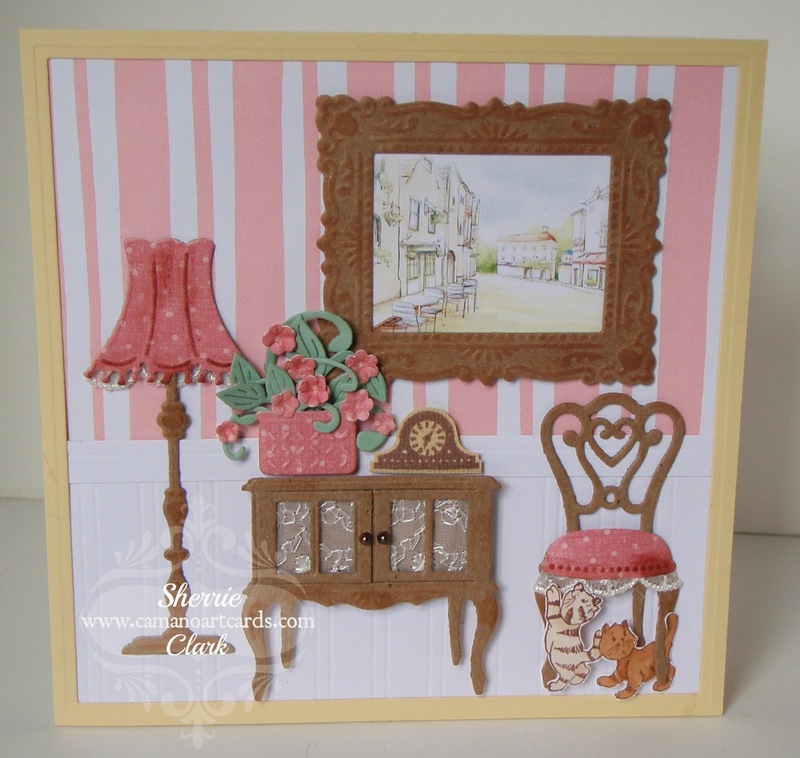 Her home is decorated in shabby chic so I wanted to make an art card she could place in her home that would match her décor. She also has many (I think up to 19 or 20) décor items that have the word, "JOY" on them so I also wanted to add to that theme. 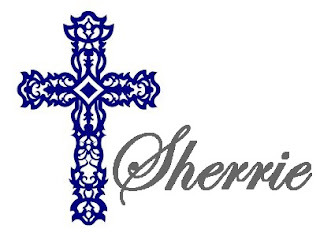 Here is what I designed for her. 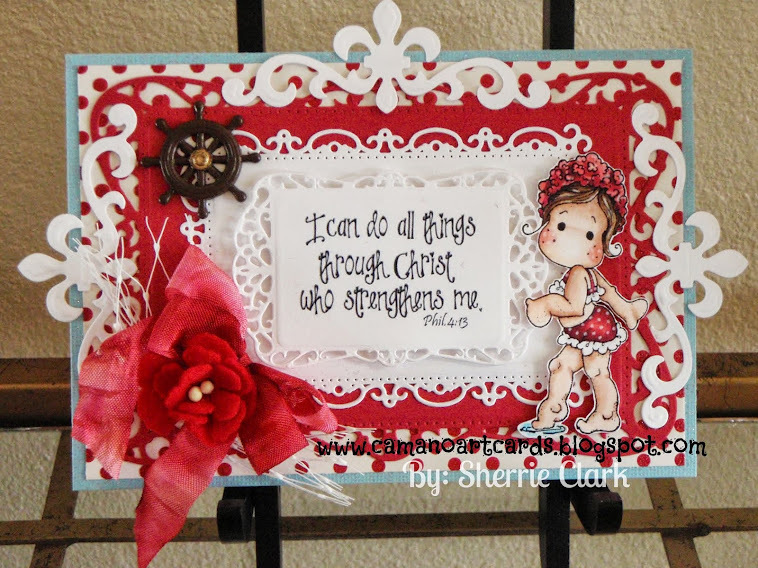 Labels: Gesso, Marianne Design, Shabby Chic, Spellbinders Antique Frame and Accents Die, Spellbinders Crosses Two, Word Art Wednesday. 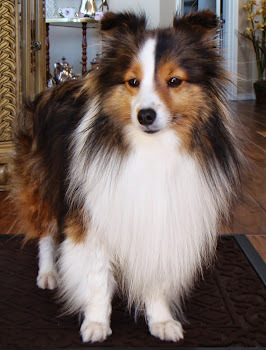 Greetings and welcome blog followers, so glad you could drop in. 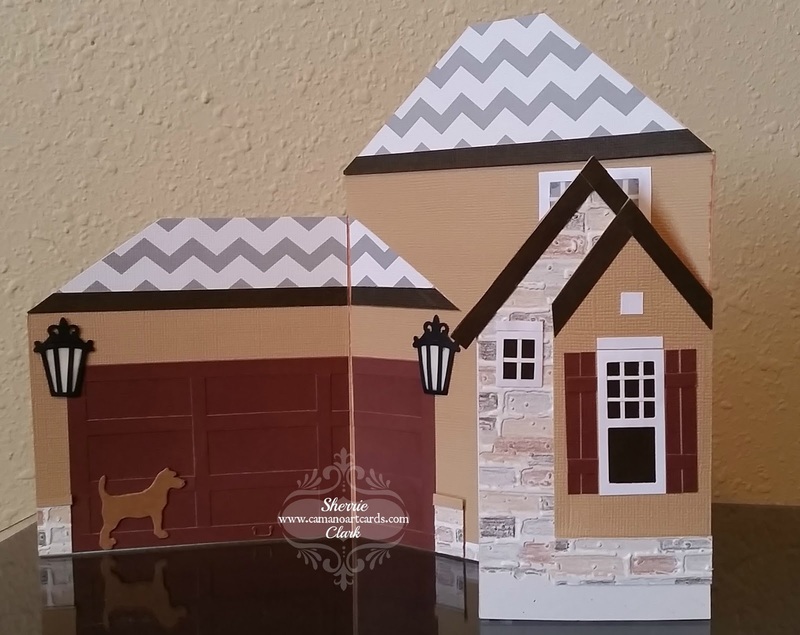 I had a great time creating todays card, "Welcome Home Living Room Scene" and the dies made it so easy. I recently purchased some new dies from Marianne Design. 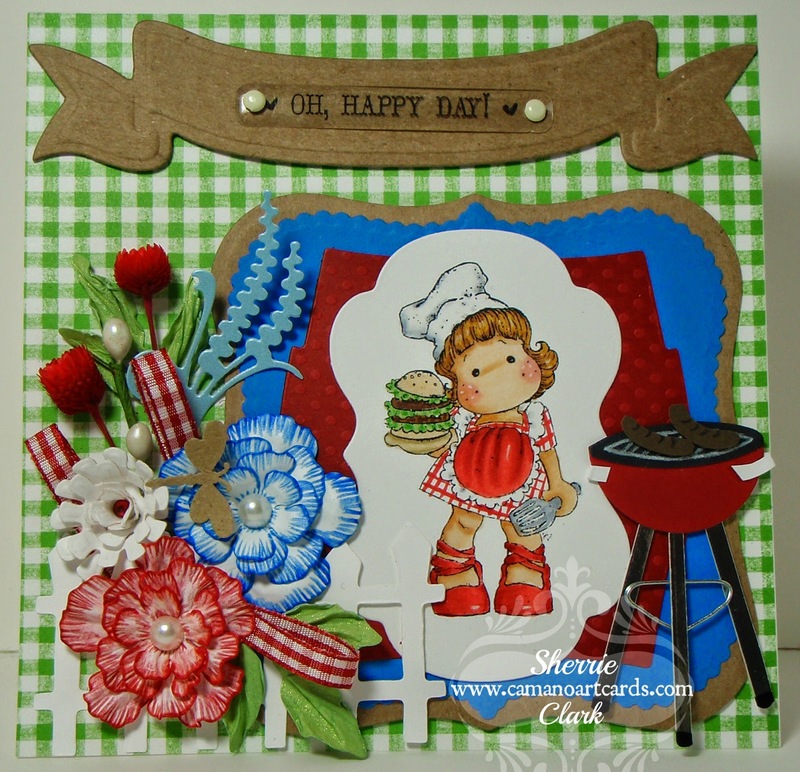 I really like her style of dies and they are so fun to create with. It is such a blessing to be able to take any subject and think, "How would God's word fit into this". I can't wait for the day when my Saviour says, "Welcome Home". I am so looking forward to being with Him and that He is creating a place for me in His house. What a glory it will be when we get there. I would describe this card as a, "Living Room" scene. It just dawned on me that I didn't put a caption on the card itself. Nice thing is it can be used for almost any occasion and I'll only need to add a caption to the inside. Isn't the Lord good in all things, even the little things like making a card for someone. How'd I do it: I started with a 6 x 12 size white cardstock folded in half for a 6 x 6 base. 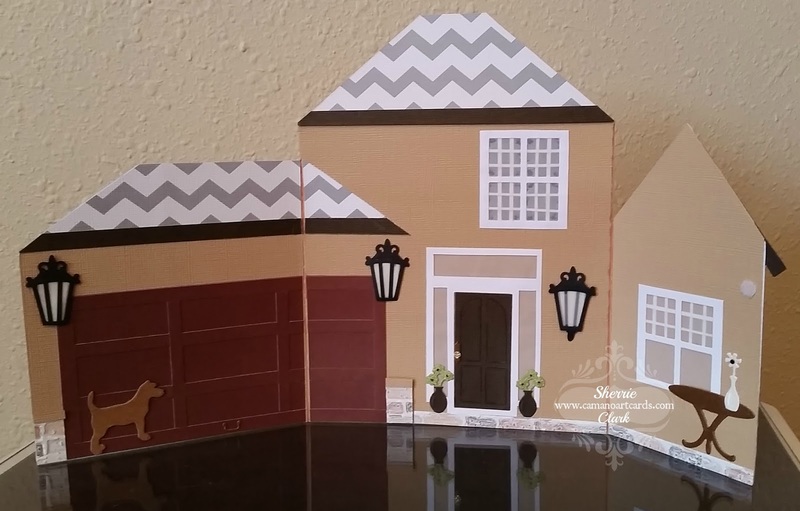 I used the pink and white striped paper for the, "wallpaper" look on the upper portion and on the lower portion I cut another piece of white cardstock to make the wainscoat and chair rail using my score board. I used my Spellbinders Grand Nestabilities Grand Squares for the yellow frame around the edge. See close up below. The chair, cupboard, lamp and frame were cut out of heavy cardstock from the back of a yellow ledger pad. 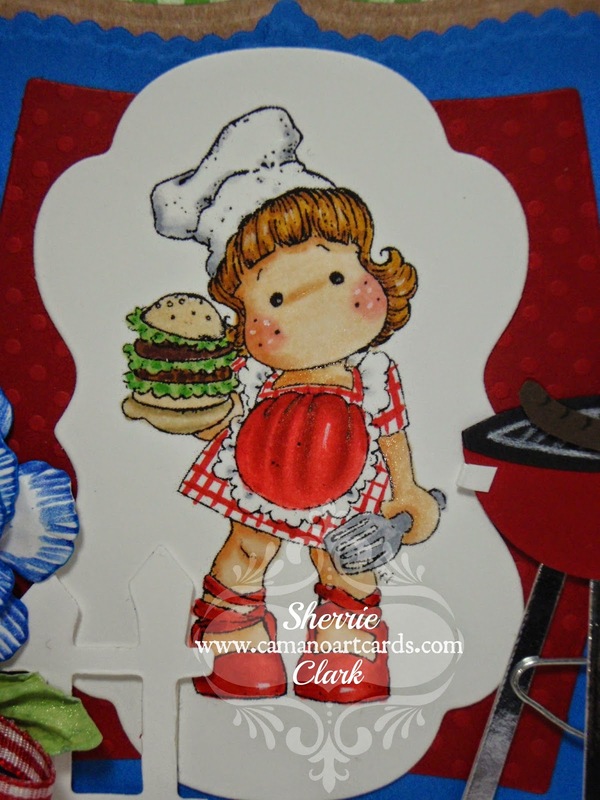 I embossed the images and then used a sponge to highlight the raised portions in CTMH Cocoa Ink. 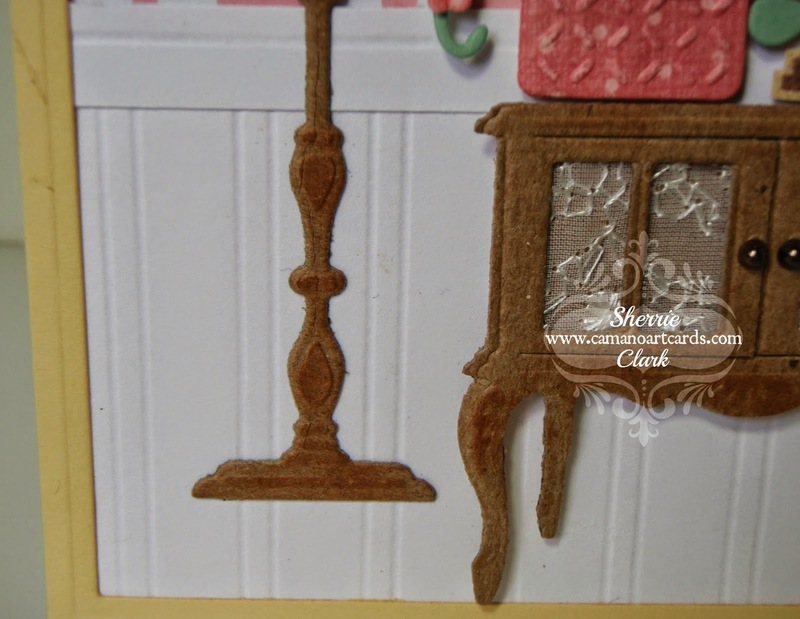 I added lace to the inside of the cabinet, below the lamp shade and chair seat. I also cut out an extra lamp shade and chair seat to add dimension as well as using my stylus on the back side of the chair to make it rounded plus I glued the back legs of the chair to the wainscoat. 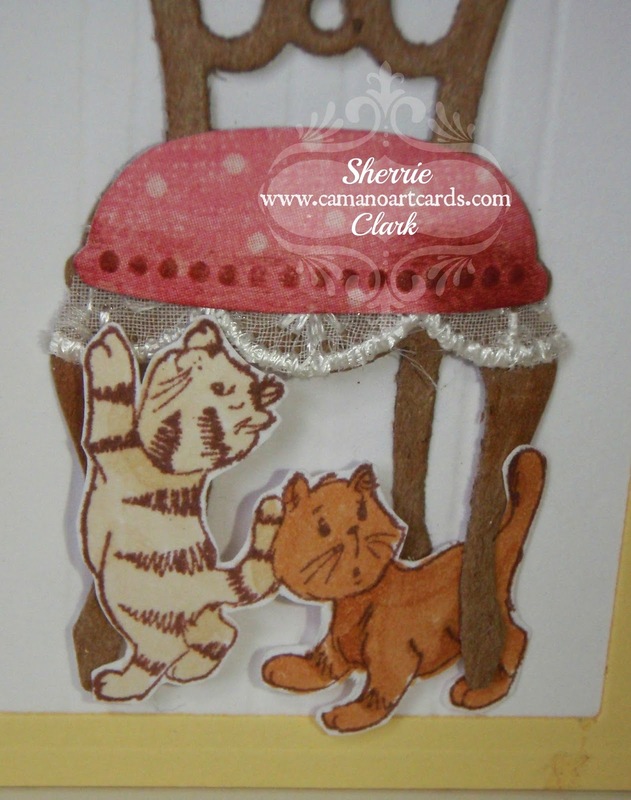 These two little cute cats may bring back memories for some long time crafters. They are from, "Art Impressions from 1996. This is still one of my favorite stamps I bought way back when. One last photo to explain how I made the basket of flowers. I used the Spellbinders, "Up, Up and Away" set using the basket for the hot air balloon for the flowers to be put in. The leaves are from Cheery Lynn B117 Fanciful Flourish Right and the tiny flowers are Spellbinders, "Cherry Blossoms". The clock is from a Close to My Heart stamp set called, "Welcome Home". Lastly, the picture in the frame was a scene I found somewhere on the internet. Oh, almost forgot the cupboard knobs are brown pearls. Again, thanks for dropping by, if you have any other questions, please feel free to leave me a comment. 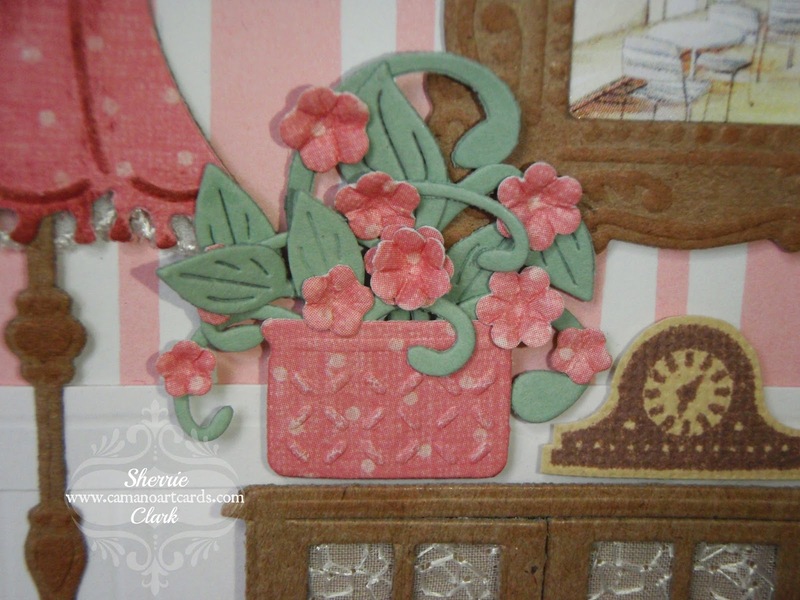 Accessories: Spellbinders: Up, Up and Away, Grand Squares, and Cherry Blossoms. Cheery Lynn B117 Fanciful Flourish Right. Marianne Design Creatables Eline's Chair and Lamp, and Eline's Cupboard and Frame. Just a very quick card and explanation today. 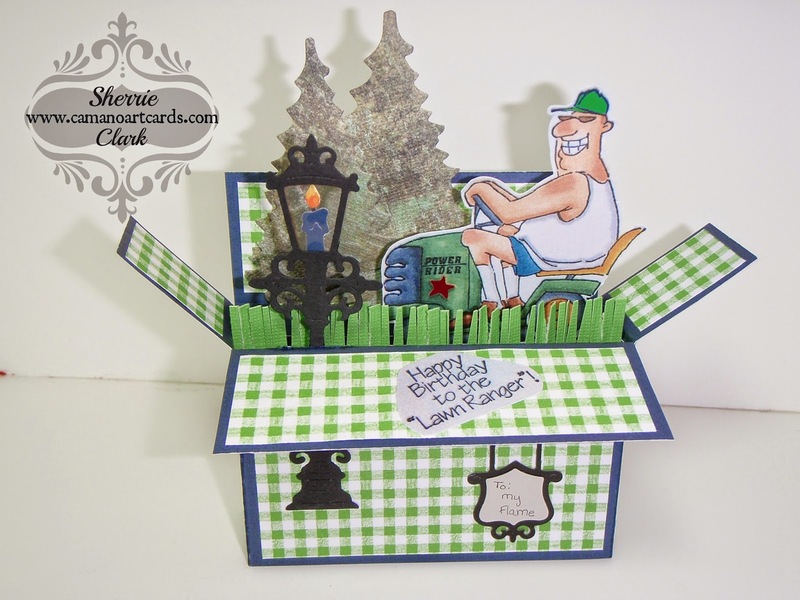 I made this card yesterday in collaboration with my friend Robyn for her husband who is celebrating a birthday in a few days. She was very excited as was I how cute it turned out. 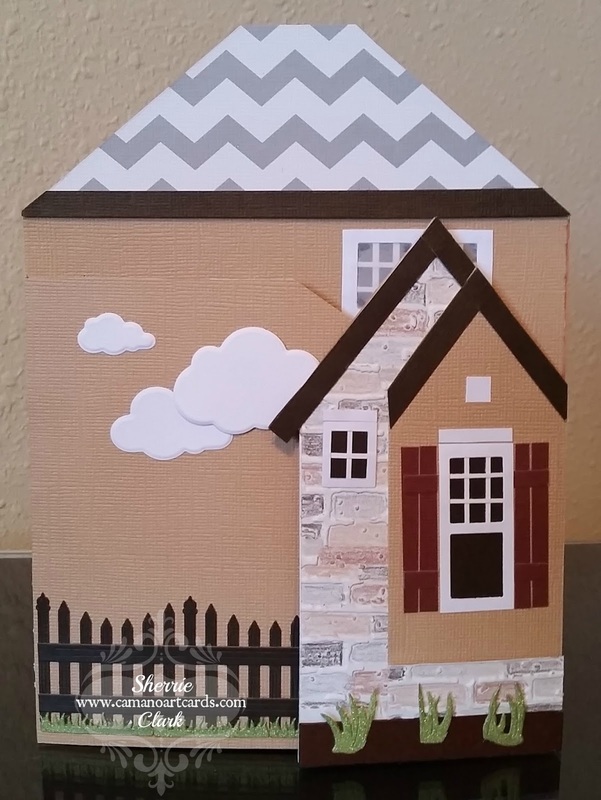 This is a pop up box card which I recently learned how to make a few weeks ago while attending a Stampin' Up party. Was loads of fun. Thanks for stopping by and we'll see you the next time. Have a good and Godly day, for of what lasting value is a good day if it isn't also a Godly day. 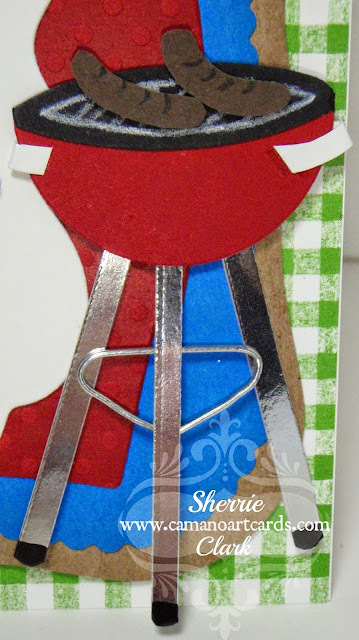 Hello again blog friends, I saw today that you could enter a post for a chance to win a gift certificate at Scrapbookpal.com (where I have purchased a lot of my spellbinder dies) if you posted a project using Stickles. 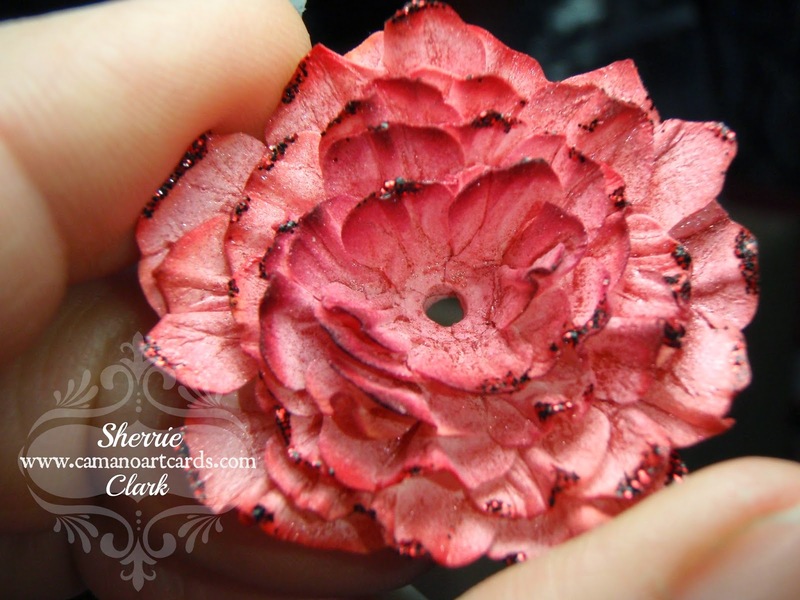 This is a flower I made using the Spellbinders Rose Creations Die and it was inked with Copic Markers and then after it dried I added red Stickles to the ends to make it glittery. I like using this method for flowers and the added touch of the stickles makes it extra pretty. Hope you try it too and check out Scrapbookpal.com for Spellbinders at one of the best discounts anywhere on the web with free shipping over $25.00 (plus no tax in most states). Now I just have to make a card to go along with this beautiful flower. Greetings fellow crafters and thanks for stopping by. Today's patriotic card is to recognize those in the military and not only to say thanks for their service and dedication but to always remember their sacrifice to keep our country free. As the title states, "Oh, Happy Day!" only because of their willingness to stand in the gap for all Americans - we salute you. The Magnolia image is colored with Copic Markers and highlighted with my Primo Charcoal White pencil. I decided to do a little experiment on the flowers with my Prismacolor pencils and copic markers. For the blue and red flowers I used the Spellbinders Rose Creations die and starting with my Prismacolored pencil I made lines from the edge of the flower toward the center and then vice versa. After that I used my copic marker to put a little color just along the edge of the petals. I used my ball stylus to shape the flowers and on the red one I also sprayed them with water and scrunched the petals for a different look. Now, on to that cute BBQ. It was fun to make and turned out quite cute. Some of the cuts I used dies and punches but I also did some cutting by hand (ie: hotdogs). I used my Primo white charcoal pencil to make the grates on the black paper. The legs were cut from a box that had a reflective mirror look and I touched the bottom of the legs with my black copic marker. The triangle is part of a small paper clip. Ok, so why the following picture? This is the reason I've been away from my blog for the past couple months. The Lord has blessed me with the other desire of my heart and that is a new Lowrey Palladium Organ. In April, my husband and I traveled to Arizona to purchase and bring this lovely instrument home by truck. I was also able to donate my old Lowrey Celebration Organ to a retirement center in my area and I get to play for them once a week during their social hour. It's lots of fun and I am so thankful to be able to use my God given talent to bless others. Well, thank again for stopping by and if you have any questions feel free to leave me a comment. Have a good and Godly day, for of what lasting value is a good day if it isn't also a Godly day. Accessories: Spellbinders: Grand Labels 1, Scalloped Labels 1, Labels 2, Labels 14, Ribbon Banners Large, Circles Small, Sizzix Fence. BBQ Handmade.